What is BRC Issue 8 Global Standard for Food Safety? The BRC Global Standard for Food Issue 8 was developed by the British Retail Consortium (BRC), UK trade organization that represents the interests of retailers. The BRC Global Standard for Food Safety was created to establish a standard for due diligence and supplier approval. All requirements of BRC food safety are generic and are intended to be applicable to all organizations of any type and size. In most cases, BRC food safety certification is a per-condition for supplying to UK retailers. It has been adopted by organizations throughout the world. Third-party certification to the standard helps manufacturers, brand owners and retailers fulfill their legal obligations and safeguard consumers. BRC food system covers a comprehensive scope of product safety areas, as well as the legal and due diligence responsibilities of both the supplier and the retailer. The key requirements of the BRC standard for food are adoption and implementation of a HACCP system, effective quality management system and factory environmental standards, processes and products and establishing process monitoring and verification system to control food hazards by scientific approach. In this new revised BRC Issue 8 for food standard, two new fundamental clauses on labeling control and supplier management are included. As compared to Issue 8, traceability, authenticity, extended risk zone concept, customer requirements and communication are the new added requirements in the standards, and accordingly better food system needs to be documented and implemented by the companies to complete BRC Issue 8 certification. Our documentation kit on BRC Issue 8 standard is provide complete information on BRC manual, BRC procedures, BRC audit checklist, templates and forms for quick BRC Issue 8 Certification. We are BRC Certification Consultant having global clients in more than 65 countries. We are offering documentation kit for BRC Certification for food Issue-8. This BRC documents kit contains well-designed sample BRC documents as per requirement of BRC food safety standard. Entire BRC food safety documents are written in editable MS Word format in plain English. 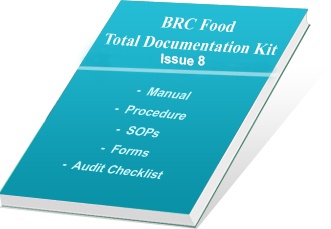 Using this BRC food documentation kit any organization can prepare ready-made documents, including BRC Food Safety Manual and Checklist, as per requirements of BRC Global Standard for Food Issue 8, within minimum time period. With the help of our ready-to-use and editable BRC food safety documents and under guidance of our BRC Certification Consultants, a number of our international clients are certified in the first trial of stringent certification audit. BRC Issue 8 Manual - food safety system manual (17 files). BRC Issue 8 Procedures (17 procedures). Blank Formats (75 sample forms) for record-keeping during BRC certification. Exhibits (total 8) that cover standard parameters to be followed. Food Safety Policies as part of BRC Issue 8 requirements. BRC Audit Checklist Questionnaire / clause-wise audit questionnaire and BRC checklist (More than 600 BRC audit checklist) for BRC Food Safety Manual Checklist. This globally used BRC documentation kit includes a sample copy of BRC Issue 8 Manual based on Issue no. 8 of global standard for food. BRC manual includes a list of procedures as well as complete overview of organization. It also includes sample copy of mandatory procedures covering all the details like preliminary analysis, prerequisite program, hazards identification, HACCP plans, management review, data control plan, etc. Also included are sample copies of blank forms and templates for easy guidance to create BRC Issue 8 food safety documentation. In this editable BRC document, more than 600 audit questions are given for preparing own BRC audit checklist on food safety. Entire BRC certification documents are prepared by our BRC certification consultants in simple English and available in easily editable word format. Our more than 200 satisfied clients all over the world have used them and successfully implemented food safety management system as per requirement of BRC global standard for food within their organization. Following are the key benefits of using our BRC food safety documentation kit for BRC Issue 8 certification. By using our BRC food safety documents, you can save a lot of your precious time while preparing the BRC documents as well as BRC Audit checklist. Takes care for all the sections and sub-sections of BRC global standard and helps you in establishing a better system. Enables you to change the contents and print as many copies as you need. The user can modify the documents as per their industry and create their BRC Issue 8 documents, including BRC Audit checklist for their organization. Readymade templates and sample documents prepared by our BRC Certification Consultant reduce your time in document preparation. The audit questions help in making a perfect BRC audit checklist. You will get better control of your system as our proven formats and templates are developed under the guidance of our experts and globally-proven consultants having rich experience of more than 20 years. Our document kit has been verified and evaluated at various levels of our team and more than 1000 hours are spent in preparation of this BRC document kit. Prepared by globally proven team of leading BRC Certification Consultant. On completion of secured purchase, we provide user name and password to download the product from our ftp server. We provide instant on-line e-delivery of our products to user by sending username and password by e-mail. BRC Issue 8 Global Standard for Food Safety Documentation Kit. BRC Food Safety Manual and BRC checklist are available at very compatible rate and anyone can purchase them by secure online transaction with Paypal.com. We provide e-delivery world-wide. Our BRC documents are used for BRC certification.